Environmentalists and the energy industry are gearing up for a fierce fight in the coming months over the nomination of Brett Kavanaugh to the Supreme Court. While hearings have yet to be set to review the appeals court judge's long legal record, Republican Senate leaders are hoping to hold them in August or September and then have a confirmation vote for the conservative jurist before the high court reconvenes on Oct. 1. "We'll work our way through the process. 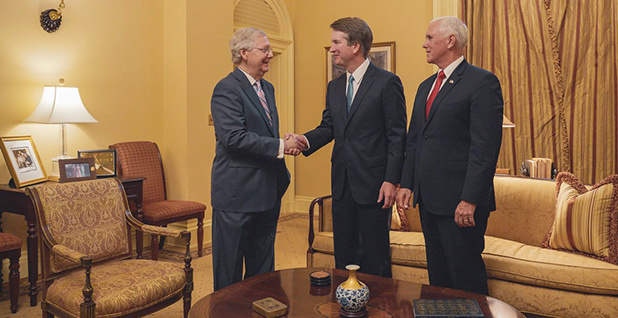 We believe it's possible to handle this nomination fully by the fall," Senate Majority Leader Mitch McConnell (R-Ky.) said yesterday. Republican leaders can confirm the pick without any Democrat support — if they are able to keep their majority intact. The Senate GOP holds a narrow majority, 51 to 49, an advantage that shrinks to a single vote with Sen. John McCain (R-Ariz.) out indefinitely as he battles brain cancer. Democratic leaders, who have lambasted the pick, have no way to stop the nomination without picking up GOP votes. The Senate eliminated its filibuster rule for Supreme Court nominees in 2017. Here's a look at some of the Republicans and Democrats whose votes could shape the balance of the court for decades to come and how their views on energy and environmental issues may affect the coming hearings, debate and vote on Kavanaugh. President Trump last month at a White House meeting made sure to remind the Senate Energy and Natural Resources Committee's chairwoman that he had helped her achieve two of her long-standing legislative goals — opening up Arctic drilling and giving the go-ahead for a road in an Alaska wilderness. He probably didn't know then that he would soon be courting Murkowski's vote for his latest Supreme Court pick. The Alaska Republican won't be an easy sell. "There are those who would say, 'Yes, I'll support him today,'" Murkowski told reporters yesterday. "Well, no, I'm not going to support him today. In my view, they're not doing what it is that we need to do, which is to take this role of advise and consent seriously. It's a lot to look at." Murkowski has deftly managed her relationship with the Trump administration, maintaining her independence but also courting it when it benefits Alaska. She cast one of the decisive votes last summer that helped sink the GOP health care bill, infuriating the right and Trump. A moderate, Murkowski is seen as more likely to favor Kavanaugh over more conservative picks floated, and she backed Trump's first Supreme Court pick, Neil Gorsuch. Democrats and outside groups who oppose Kavanaugh's nomination are pinning their hopes on the Senate's most reliable swing vote. Collins, a moderate Maine Republican who like Murkowski voted to confirm Kavanaugh as a federal appellate judge more than a decade ago, told reporters yesterday the Supreme Court nominee has "impressive credentials" and "extensive experience" but is not yet backing him. Collins, known for an independent streak, opposed the nomination of former EPA chief Scott Pruitt over his environmental record. She, however, consistently has backed GOP Supreme Court picks, among them Gorsuch. Greens, though, see an ally in the Maine senator with a 63 percent rating from the League of Conservation Voters. Already, the Progressive Change Campaign Committee is running online ads in Maine and Alaska pressuring Collins and Murkowski to oppose Kavanaugh. Trump's frequent Senate GOP nemesis, who is not running for re-election, could be a wild card in the race to 50 votes. The Arizona Republican began blocking circuit court nominees last month to try to force a vote on his legislation blocking the president from implementing new tariffs. For now, Flake says he won't hold up a Supreme Court pick over his concerns about a trade war that has rattled the agriculture and energy industries. He, however, has stopped short of endorsing Kavanaugh, calling him a "smart pick" whom he is eager to meet. When they do meet, it won't hurt that Kavanaugh's Senate guide will be former GOP Senate Whip Jon Kyl — a Flake ally whom he replaced in the chamber five years ago. "I want a cross between Socrates and Dirty Harry," the Republican from the energy state of Louisiana, who is known for his humorous quotes, told reporters this week when asked about Kavanaugh. A Senate Judiciary Committee member, Kennedy and his folksy style could provide some of the lighter moments at what is likely to be three or four days of grueling hearings for Kavanaugh. But it would be wrong to dismiss Kennedy as simply a funnyman. His grilling of a Trump federal judge pick earlier this year over simple legal terms left the nominee stumped and forced him to bow out from consideration. Kavanaugh, touted as one of the nation's leading legal minds, is unlikely to be tripped up over court basics, but it'll be worth watching the questions raised by Kennedy, who has not been bashful in taking on the Trump White House. The ranking member of the Environment and Public Works Committee is the only one of four Democrats who voted to confirm Kavanaugh to be a federal appellate judge in 2006 who still is in the Senate. But Carper already is signaling skepticism about backing him this time around, saying the nominee's legal writings related to the environment are not "too encouraging." Carper, who has a history of crossing party lines, also has suggested bipartisanship may not apply this time because he's still "not over" the GOP's refusal to consider President Obama's 2016 high court selection, Merrick Garland. If Carper were to support Kavanaugh again, green groups — which have been pleased with the Delawarean's tenure atop the EPW Committee after some initial wariness over his moderate tendencies — would likely be infuriated. A senior Judiciary Committee member and leading voice on climate change, the Rhode Island senator is the mostly likely to question Kavanaugh on his environmental record. Whitehouse was the only senator to raise the climate issue at the confirmation hearing for Gorsuch, saying looser campaign finance laws backed by the high court are allowing the fossil fuel industry to influence elections. Whitehouse is making similar populist remarks about Kavanaugh, saying on Twitter that "special interests approved this nominee" and accusing the GOP justices of "favoring big business." Kavanaugh, for his part, has said from the circuit bench that he believes in man-made global warming, but green critics say his rulings have often curbed the reach of EPA. The West Virginian is the most likely Democrat to back Kavanaugh. He faces a competitive re-election this year in a state where Trump's support for coal has made the president a folk hero. The former governor has often sided with Trump, including backing Gorsuch, but so far has only suggested that he would meet with the nominee to decide whether his rulings and temperament are right for the court. Manchin is likely to be pleased with circuit court opinions written by Kavanaugh that have suggested EPA should weigh the costs of environmental rules on businesses, among them coal operations. But he might take issue with the judge's 2011 ruling in favor of EPA's retroactive veto of a West Virginia mountaintop-removal mining project. The North Dakota Democrat's decision on Kavanaugh will be closely watched by energy interests, which have been a major backer of Heitkamp's bid for a second term this fall. Americans for Prosperity, a group allied with the Koch brothers that has given a modest donation to Heitkamp, said it's spending seven figures to sway swing-state senators to back Kavanaugh. Often a swing vote, Heitkamp said after Trump's announcement she would thoroughly "review and vet" the pick and earlier called for a "pragmatic, compassionate" choice who would be "above politics." Observers say Heitkamp's support for Gorsuch suggests she will likely back Kavanaugh, particularly as she faces voters in a state that Trump carried by more than 30 points. The Montana Democrat, who is seeking a third term this fall in a red state, already has shown he's willing to oppose Trump's court picks. He voted against Gorsuch, citing in part concerns over his support for loosening campaign financing rules. Tester, who has made public land access and conservation issues a centerpiece of his re-election, will likely be eager to hear Kavanaugh's views on the issue. The topic is timely given that the first case the court is due to hear this fall will be over the limits of critical habitat under the Endangered Species Act. Kavanaugh in 2011 ruled against using that designation to protect endangered shrimp after a handful were found on 143 acres in Southern California. Tester told reporters yesterday he would "probably" hold off on his decision until after the confirmation hearing.